After a few long days and nights of hacking, I've decided to finally do something this this blog that I've put together thanks to Google Domain's awesome abilities to connect a blogger blog in with a already-purchased domain. Anyway, I figured I'd kick off with a question that I think is on a lot of people's minds. Why hack? Since I took my first programming class at the University of Iowa College of Engineering, Engineering Problem Solving II, I have been very interested in programming. I found out that programming was my forte and it really just clicked. While that was my first time formally programming with logic and things like that, I have been a computer user for a long time. When I was a kid, my dad was fortunate enough to have access to a computer where I learned how to type...and play video games. According to my parents, from a young age I was always a bit more inclined towards the computer, learning how to save files early on and show my mother how to do some of those tasks that we all now think of as being normal tasks. Once I got into Elementary school, I can vividly remember doing things on the computer that other kids were unable to do. I can also remember the first time I was shown google (by another kid) and started using that rather than ask jeeves, alta vista or any of the other search engines that were around back then. I always found the computers to be very interesting, growing up, I used almost all macs exclusively, that's what my dad was able to get me and my brother for our bedrooms and that's what our school had available. I guess the first programming-like thing I did came when I was in Elementary School, when you could check out the typing computers (only had a display for text Picture attached) and I would find a way to turn the whole thing into an ascii-art animating tool machine. That takes a lot of logic and thorough thought to make something cool. As soon as I arrived to Junior High, there were actual computer typing classes that I took. 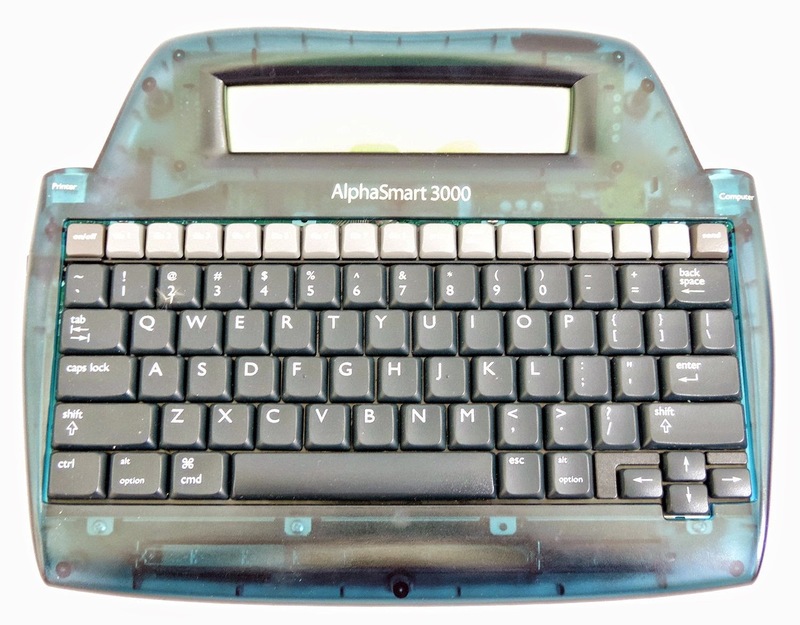 Granted, the first class was much more about learning how to type by the home keys (by covering all of the letters and forcing you to learn how to touch type). Because I enjoyed that so much, I decided to take the more advanced class, where you learned how to use the 10-key pad and some more things with other programs like Microsoft Excel for processing numbers, HTML for building websites using yahoo geocities for 'hosting'. I got my first personal e-mail account thanks to hotmail, but I just fell in love with using the computer at that time. In High School, I learned how to do things, like programming BASIC on my TI-83 plus to assist in calculations during class. I found that if I could generalize the formulas used and still be able to process things like normal, I actually learned the concepts much better. I didn't take any additional computer classes, but the electronics class that I took taught us some of the concepts and since my teacher was also the computer teacher, we learned ways to 'hack' the school's internet network. See, this was right at the ripe time when Facebook had released for High Schools along with Colleges, so many of us knew how to use 'Proxy Sites' in order to browse Facebook during the school day. Once I arrived at college, I was warned by my brother how horrible the programming class was, and since I had not formally written computer programs that went ON computers, I was worried just like everyone else who hears horror stories about classes. However, after a few weeks of class, I could tell that the concepts in class clicked. I was able to provide assistance for classmates and begin to learn what sorts of things could be accomplished. I immediately took the next programming class so that I could continue to learn and excel in that field, and I was very happy that I was able to do well in the class and learn more valuable information. At the time I was still pre-medicine thinking that with a programming background, I'd be able to either practice medicine, or build applications to assist with the practice of medicine. My sophomore year, I met Phil and we decided to spend our free time on making a cool video project that included video editing, coming up with scripts and many production-related items. On top of that, I decided that I wanted to put up a website that we could put some information about our episodes on there, so I learned how to work with databases, write php, do some (horrible) css management and learn how to do hosting things. But there was a lot of logic, a lot of other things to learn about at the time, and I found it to be a great learning experience. Hacking really started kicking off my love of side projects. After getting some good basis, I used my programming background to assist with my job as a research assistant in a Physiology lab at UIHC. Converted a mouse spreadsheet to a mouse database and began to better learn how relational databases work. After I bombed the MCAT, I decided that I should focus my time on the thing that I love to do, program. I took some additional classes in programming to fulfill requirements for graduation from school with my full intent of going for a degree in Bioinformatics. I was asked to become a TA for the class that got me started on this crazy journey that has brought me where I am today. I also did a large Senior Design project with both a hardware component and a very large python software component to control that hardware. I hope to write a post about it at some point soon. I took an internship at Bio::Neos where I worked on the VCMap tool which was a java application. I realized just how important programming was for researchers as well as doctors when it comes to medicine. But I also really loved the time that I spent as a TA the semester before. I spent time trying to improve the performance of the tool when importing a large dataset (which took a long time) and was able to get things done efficiently and successfully. I really then learned exactly how I wanted to go through Graduate School. I had a great experience at Bio::Neos and learned a LOT about how to effectively develop software in a small company. Shortly after I started my first semester as a TA, I quickly took the role of processing the files that were used for grading as well as assisting with behind-the scenes things, formatting homework, formatting tests, etc. I found out the best way to script most of the process and simplify the process so that just about anyone could later take over, and that has luckily become true. I spent time hacking away things to help with my processes, writing scripts to automate database downloads of my research data and process it. Creating web applications to help with processing students in crowded office hours. Little-by-little, I gained the knowledge of different systems and adapting technologies. I learned how to set up a linux server to host web things, I learned git, I learned better coding practices and how to recover from problems that I didn't have any experience with. Hacking is what gets you the ability to fix unforeseen circumstances. It's the basis of most of the change in technology. Hacking is fun, you learn things, and it causes people to innovate. Google didn't come about because Larry Page and Sergey Brin were just doing normal programming. It came about because they saw an issue and hacked a solution. That solution is now something that is bigger than they likely first imagined. So, Hack. Hack because you can. Hack because it's fun. Hack because you want to learn.